Planning to wait until spring to garden? Fall is better. The soil is still warm, and with autumn rains, the new plants will grow their roots and come to robust life next year. Fall-planted perennials produce more flowers than those planted in spring. Woody plants get a head start and could produce flowers and berries their first year. First, assess your garden. You’ve watched your landscape since April, and its flaws are still visible. Have any nasty invasives moved in and need to be replaced with native plants? Do you have more lawn than you need? Should any sickly-looking plants be removed? Are some plants obtrusively tall and would show better in the back of the garden? Are short plants hidden by tall plants? Can your garden support more birds, butterflies, bees, and other wildlife? 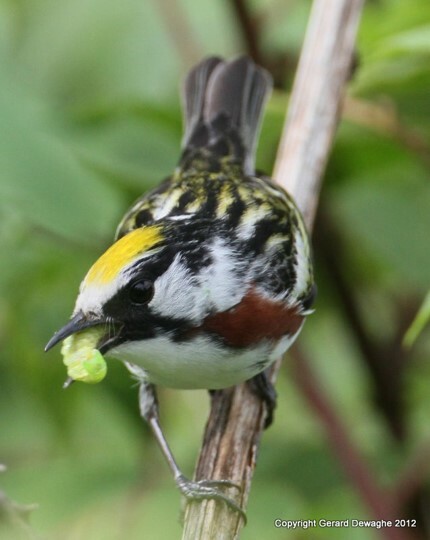 The Chestnut-sided Warbler’s primary diet is caterpillars. Most young birds eat only caterpillars. © Gerald Dewaghe Click to enlarge. Do you have room for an oak? White Oak, Quercus alba (See 2013 Prime Plants for Nature Awards), Chestnut Oak (Q. montata), Red Oak (Quercus rubra), and Black Oak (Q. veluntina) are possibilities in our area. Oaks host the greatest numbers of native insects, which are high-quality foods for birds (see Doug Tallamy’s Bringing Nature Home). Adding additional native trees and shrubs to your yard will increase your yard’s biomass, i.e. all living things including insects, and significantly enhance your yard’s ecosystem. 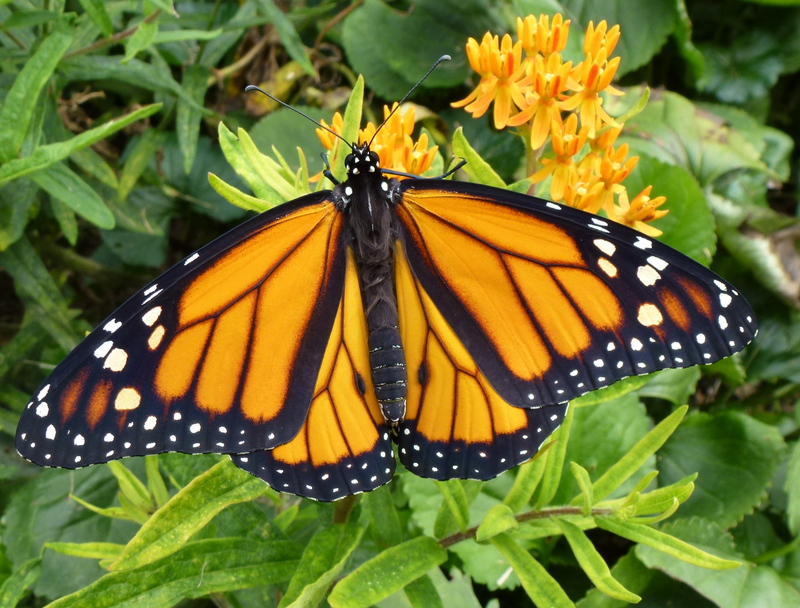 To host Monarch butterflies, you can never grow enough milkweed (See “Marvelous Migrating Monarchs Need Our Help”). Monarch butterfly nectaring on Butterfly Milkweed. © Edie Parnum. Click to enlarge. All of us can plant more Swamp Milkweed (Asclepias incarnata), Common Milkweed (A. syriaca), or Butterfly Weed (A. tuberosa). Other native plants feed butterfly caterpillars, too. For example, a Spicebush (Lindera benzoin) (see 2018 Prime Plants for Nature) hosts Spicebush Swallowtail butterflies. Perennials such as Purple Coneflower (Echinacea purpurea), Garden Phlox (Phlox paniculata), New England Aster (Symphyotrichum novae-angliae), and other asters offer copious amounts of nectar for butterflies. Gray Hairstreak butterfly on Short-toothed Mountain Mint. © Edie Parnum. Click to enlarge. Yes, you want more native bees, wasps, and flies, of course (see “Pollinators Need Our Help!”). 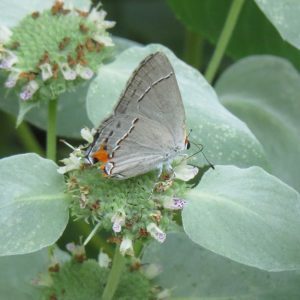 Short-toothed Mountain Mint (Pycnanthemum muticum) is a must. Also consider Anise Hyssop (Agastache foeniculum), Blue Mistflower (Conoclinium coelestinum), Joe-pye Weed (Eutrochium purpureum), Beard Tongue (Penstemon digitalis), Obedient Plant (Physostegia virginiana), Black-eyed Susan (Rudbeckia fulgida), and the butterfly-attracting native perennials listed above. Ruby-throated Hummingbird feeding on Trumpet Honeysuckle. © Ruth Pfeffer. Click to enlarge. 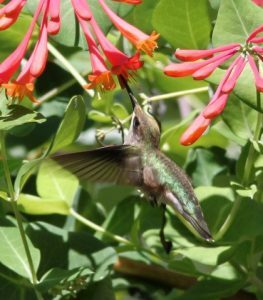 In addition to Trumpet Honeysuckle, Cardinal Flower (Lobelia cardinalis), Great Blue Lobelia (L. siphilitica), Bee Balm (Monarda didyma), and Wild Bergamot (M. fistulosa) attract hummingbirds. Try some new native plants. 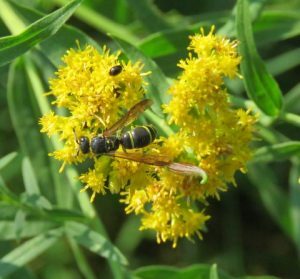 Potter Wasp nectaring and pollinating Grass-leafed Goldenrod. © Edie Parnum. Click to enlarge. How about goldenrods? Several species are well-behaved and attractive. They are great late summer/fall pollinator plants and don’t cause hay fever. My favorites include Blue-stemmed (Solidago caesia), Zig-zag (S. flexicaulis), and Grass-leafed Goldenrod (S. graminifolia). Sound like too much? Pick and choose. But, remember, fall gardening is easier than in the spring. It’s cooler. With the autumn rains, less watering is required. You can plant up until six weeks before hard frost, as late as early November in southeastern Pennsylvania. And, there’ll be less to do in the spring. Is there a down side to gardening in fall? Well, you must wait until spring to see the results. The new leaves will appear, the flowers will bloom, the insects will hatch. And, your garden will nurture a multitude of living things. ——————————————————————————————————————–For a list of retail sources of native plants and native plant sale events, click here. 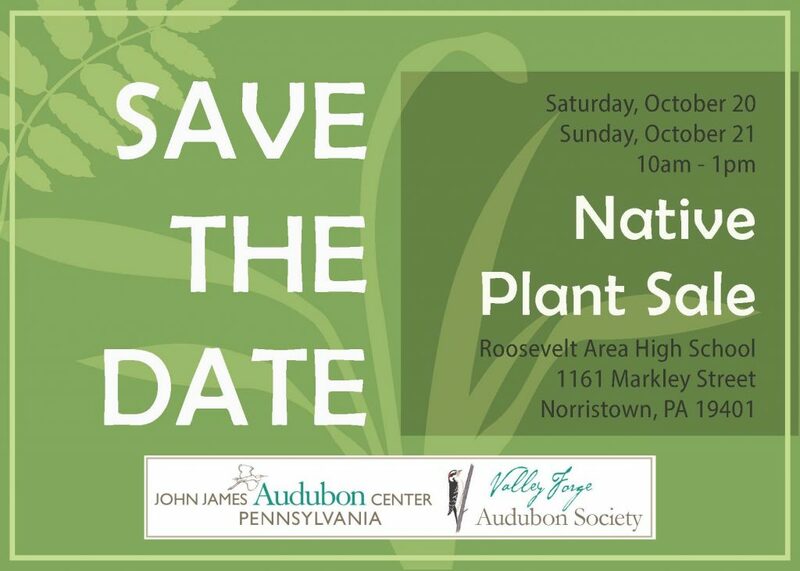 A special native plant sale sponsored by John James Audubon Center and Valley Forge Audubon Society will take place on October 20 and 21, 2018. Details are below. This entry was posted in Native Plants by barb. Bookmark the permalink.